Anne Hutchinson’s home once stood at the site of the former Old Corner Bookstore and the current home of a Chipotle restaurant. An old plaque memorializing one of Boston’s most important Colonial-era women may soon find its way onto the Freedom Trail. 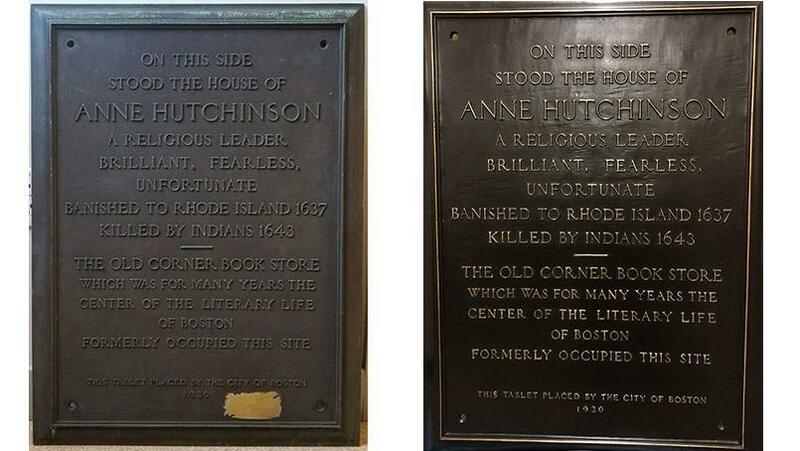 The commemorative plate honoring Anne Hutchinson, who was banished to Rhode Island in 1637 for challenging the Puritan patriarchy’s religious leadership, was in storage for years. Last summer, the Bostonian Society, a nonprofit that preserves artifacts and records from the Old State House, gave it to Historic Boston Incorporated, which owns the Old Corner Bookstore building where Hutchinson’s home once stood. Historic Boston had the plaque restored late last year and is considering hanging it in or outside the Old Corner Bookstore building, at the corner of Washington and School streets. 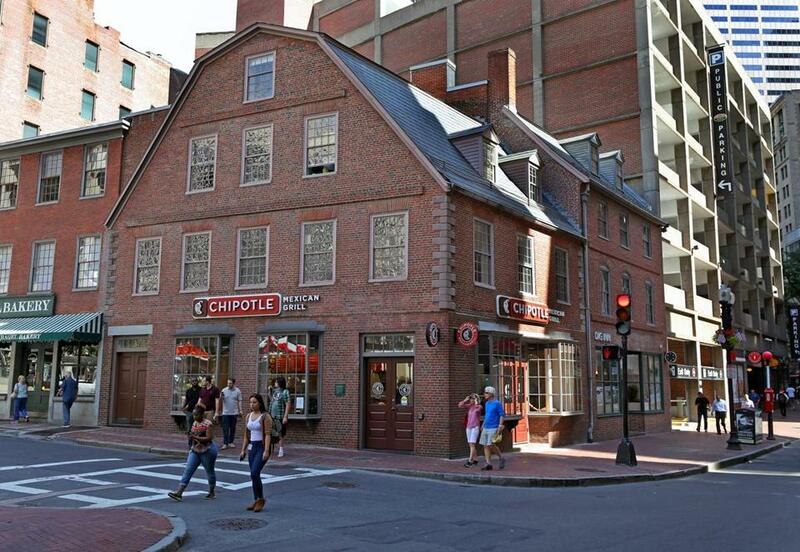 The structure, now a Chipotle, is downtown Boston’s oldest commercial building and the onetime home of the publisher of Nathaniel Hawthorne, Ralph Waldo Emerson, and other American literary giants. Historic Boston executive director Kathy Kottaridis said she hopes the plaque will help draw attention to the building’s rich history, and to Hutchinson. Up to 80 people — including Henry Vane, a former colonial governor of the Massachusetts Bay Colony — would attend Hutchinson’s radical sermons, which challenged the teachings and clerical authority of the Puritan fathers. Her home also served as a space to teach other women to read and discuss the Bible. Hutchinson preached that people could go to Heaven on faith alone, and that people should communicate with God directly, assertions that eventually led to her demise. Among those displeased with her growing influence were Governor John Winthrop and Puritan clergyman John Cotton. The two sent spies to Hutchinson’s house, and Cotton tried to pass resolutions forbidding Hutchinson from holding meetings, which she ignored. Cotton and Winthrop ordered Hutchinson to the General Court and tried her for heresy. At the trial, Hutchinson passed an intensive quiz on her religious knowledge. She told Winthrop and Cotton that God would punish the Puritans for persecuting her, causing Winthrop to accuse her of heresy and banish her to Rhode Island. Former Massachusetts Governor Michael S. Dukakis symbolically pardoned Hutchinson in 1987. Historic Boston believes the plaque may have once hung on the outside of the Old Corner Bookstore, though it hasn’t found any photos documenting that. Until it is re-situated, people who wish to honor Hutchinson can visit her statue located near the Massachusetts State House. A plaque in memory of Hutchinson, whose sermons challenged the teachings and clerical authority of the Puritan fathers, was restored and will possibly be placed outside the site of her old home.